In Singapore, taxes are only to be levied by the legal authorities; namely, the Inland Revenue Authority of Singapore (IRAS), as specified in the Income Tax Act (to be referred to as the Act) of 1948. IRAS is the Singaporean government’s primary revenue collection body. Another law related to taxes in Singapore is the Economic Expansion Incentives Act (EEIA) of 2005, which was introduced to encourage growth of targeted industries and activities. The two acts mentioned are supplemented by various pieces of subsidiary legislation. Among this subsidiary legislation are several comprehensive tax treaties. These treaties help prevent the imposition of double taxation on cross-border transactions, enhance international trade and investment by clarifying tax rules between countries, and provide for the avoidance of fiscal evasion. A company is taxed a flat rate on chargeable income, regardless of whether it is a local or foreign company. A newly incorporated company which satisfies the qualifying conditions can claim full tax exemption on the first $100,000 of normal chargeable income* (excluding Singapore franked dividends) for each of its first 3 consecutive YAs. *A company is resident in Singapore if the control and management of its business is exercised in Singapore. ** From YA 2010, companies limited by guarantee are subjected to the same conditions imposed on companies limited by shares. Tax residence of business entities for tax purposes refers to whether management and control are exercised in Singapore. The site where the directors of a company manage and control its business, and hold their board meetings is where the company is deemed resident (regardless of property location). Your Company’s income source depend on the phrase “accruing in or derived from Singapore” in the Act describes the territorial scope of Singapore’s tax system. This means that Singapore has the right to tax income if the source of the income is in Singapore. A Company will not be liable for income tax unless income has accrued to the company. Income cannot be said to have accrued to a company unless the company has an unfettered right to deal with it. Another important phrase found in the Act is “received in Singapore from outside Singapore”. This causes foreign-sourced income to be taxable in Singapore, but only if the income is received in Singapore and not tax-exempt. This above sentence can created confusion for company level , it seems to refer that if the income is not remitted to Singapore then it is not taxable. In our opinion, it is not true, let me show you why. 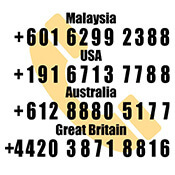 For example : MNC with a group of Asian companies , Singapore tax resident company invoiced oversees clients and the group treasury centre is in Hong Kong hence no money is remitted to Singapore for the invoice payment. Does it means that this income is non taxable because the money is not remitted into Singapore bank? From the above , it showed that it is taxable. The First YA is the basis period during which a company is incorporated. New start-up companies get tax exemption, and companies get partial tax exemption from the fourth YA onwards. Singapore’s statutory income for YA is computed based on the income derived in the preceding calendar year (basis year) from all sources. This will form the basis of your tax assessments and provide a guide for yearly taxable income. As of 2009, November 30 is the due date for Singaporean companies to file income tax. Tax guides are widely available if needed by businesses. A company must file a complete set of returns, which include Form C, audited/unaudited accounts, and tax computation. All companies must file their tax returns before November 30 to avoid enforcement action. A Company Secretary will compile and prepare the required documents. Singapore introduced a single-tier corporate income tax system on 1 January 2003. Taxes paid by companies on chargeable income is the final tax. All dividends paid by companies to its shareholders are tax free. Singapore has no capital gains tax (including sale of fixed assets, gains on foreign exchange, capital transactions etc). Double taxation happens when income is taxed twice. Double Taxation Agreements (DTAs) are concluded between participating countries globally to avoid income being taxed twice. DTAs stipulate that the country of residence agree to either give credit to its residents for income which is taxed at reduced rates, or to exempt the income from tax. Companies that conduct internal businesses will only pay taxes generally where income is generated. For example, a DTA between Singapore and Hong Kong states the conditions on which country will receive corporate tax based on business activities or operational production. The objective of income tax treaties are to help businesses avoid double taxation on their income. This helps ensure the global market remains competitive and governments continue to receive taxes from businesses. 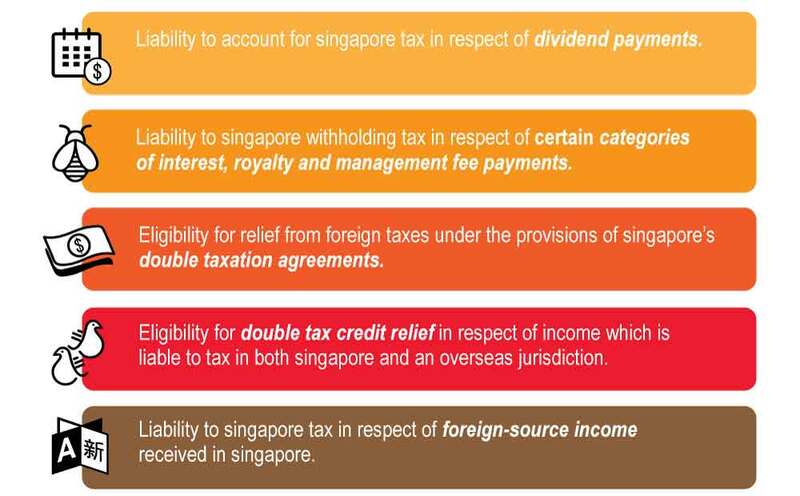 Singapore has concluded tax treaties with several countries, both Asia and internationally. Your company must declare its income by completing the Income Tax Form for companies. This is known as Form C and must be completed each year. IRAS will send the first Form C to a newly incorporated company in the second year following the year of incorporation. Thereafter, Form C for subsequent YAs will be sent to your company in Mar/Apr every year. You may need to request for the first Form C to be sent to you earlier, that is, in the year immediately after the year of incorporation (instead of the second year following the year of incorporation) under certain circumstances. Please note that income is assessed on a preceding year basis. This means that the basis period for any YA generally refers to the financial year ending in the year preceding the YA. Your company is incorporated on 1 Jul 2007 and its financial year end is 30 Jun. If your company’s first set of accounts covered the period from the date of incorporation (1 Jul 2007) to 30 Jun 2008, your accounts is for YA 2009. You do not need to request for Form C for YA 2008. Your company is incorporated on 1 Jul 2007 and its financial year end is the 31 Dec. If your company’s first set of accounts covered the period from the date of incorporation (1 Jul 2007) to 31 Dec 2007, your accounts is for YA 2008. In this case, you have to request for Form C for YA 2008. You can request for Form C via the form Request for Form C for Newly Incorporated Companies or Companies Granted Waiver to Submit Form C/Change of Particulars (36KB). If your company’s first set of accounts covered the period from the date of incorporation (1 Jul 2007) to 31 Dec 2008, your accounts is for YA 2009. In this case, since the first set of accounts is for YA 2009, you do not need to request for Form C for YA 2008. Your accounts for the period from 1 Jul 2007 to 31 Dec 2008 is to be submitted with the Form C for YA 2009, which will be sent to your company in Mar/Apr 2009.When you file Form C for YA 2009, please note that you need to submit separate tax computations for YA 2008 and YA 2009 since your accounts covered a period of more than 12 months. You have to apportion the income for the period from 1 Jul 2007 to 31 Dec 2007 (YA 2008) and 1 Jan 2008 to 31 Dec 2008 (YA 2009). When submitting Form C for YA 2009, please attach a covering letter stating that you have enclosed the tax computations for YA 2008 and YA 2009. Audited/ unaudited financial statements, tax computations, claim forms and other documents to prepare and/ or file with your Income Tax Return (Form C-S/ C). Companies are required to keep proper records and accounts of business transactions. Using an accounting software helps business improve record keeping and comply with tax obligations. Business can also use the information captured in the software to ensure that operations are effective and efficient. The IRAS’ Accounting Software Register lists the accounting software that are able to meet IRAS’ technical requirements and businesses considering to use an accounting software for record keeping are encouraged to consider those in this list. other documents such as claim forms for claiming certain tax deductions/ benefits. The above mentioned documents are to be prepared and retained for submission upon IRAS’ request, except for Declaration for the Purpose of Claiming Writing-Down Allowances for Intellectual Property Rights (IPRs) under Section 19B of the Income Tax Act. For financial years starting on or after 1 Jul 2015, dormant companies and companies that meet the “small company” criteria are not required to audit their financial statements. This is provided for under the Companies Act. entire group must be a “small group”, i.e. the group must meet at least 2 of the 3 quantitative criteria on a consolidated basis for the immediate past two consecutive financial years. Please refer to ACRA’s website for more information on the Small Company Concept for Audit Exemption. You may wish to refer to Pages 123 to 133 of ACRA’s Guidebook for Directors for a sample of audited/ unaudited financial statements. Companies that have filed a full set of financial statements with ACRA in XBRL format are not required to file the same with IRAS. Please refer to ACRA’s website on how to prepare your financial statements in XBRL format. What counts as deductible or non-deductible business expenses. Business expenses are expenses you have paid to run the business. Some examples are CPF contributions, wages, renovation, advertising, etc. Ex-gratia retrenchment paymentsand outplacement support costs, where there is a complete cessation of business. 4) When and How file Form C/C-S? 5)What is Estimated Chargeable Income (ECI) ? Your company has to furnish an estimate of its chargeable income known as Estimated Chargeable Income (ECI) within three months from the end of its accounting period. For example, if your company’s financial year end is 31 Dec, you have to furnish ECI for the accounting period ending 31 Dec 2007 by 31 Mar 2008. ECI is an estimate of the company’s taxable income (after deducting tax-allowable expenses) for a Year of Assessment (YA). Besides stating the ECI, you have to declare the company’s revenue in the ECI Form. This declaration is compulsory with effect from Jan 2017. Revenue refers to a company’s main source of income, and excludes items like gain on disposal of fixed assets. If your company is an investment holding company, your main source of income will be your investment income (e.g. interest and dividend income). Where the audited financial statements are not available, you can refer to the company’s management accounts for the purpose of declaring the revenue amount. Should the revenue amount based on audited financial statements be different from that declared in the ECI Form, and there is no change in your ECI, you are not required to revise the revenue figure. All companies including new companies are required to file ECI within three months from the end of their financial year except for companies that qualify for the administrative concession and those that are specifically not required to file. Companies will receive a notification from IRAS to file the ECI in the last month of its financial year. Companies should still proceed to file the ECI within three months from its financial year end even if they do not receive the ECI notification. To find out how to file ECI, plan your finances and taxes wisely. Paul Hype Page & Co. is an ACRA-certified business adviser. Our Consultants will give you more information and assistance on policy updates, compliance regulations and changes to tax conditions. 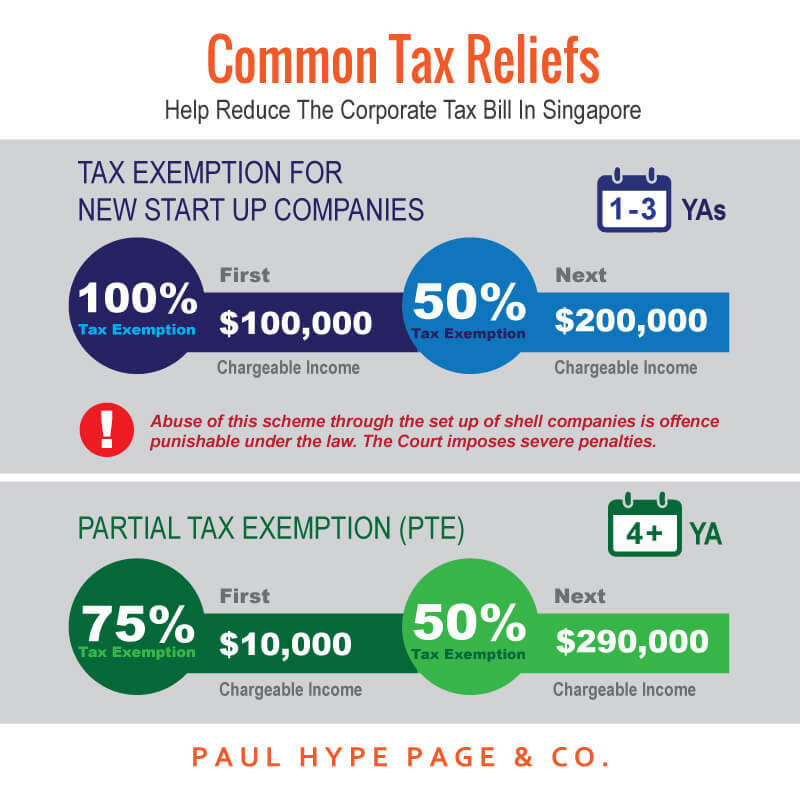 Corporate tax in Singapore. Singapore attracts investments from around the world by reducing its corporate income tax rate and introducing different tax incentives. At 17%, Singapore has one of the lowest corporate tax rates in the world. Hi, I’m doing my ACCA with a paper remaining, and I am very interested in doing tax. Was wondering if you company have any intention to hire. Thanks and regards. Thank you for your interest with our company. Do drop us an email to angela@php-cpa.com.sg for job application. Our HR will contact you should you be shortlisted.